Dental implants offer the most lifelike design when it comes to replacing your missing teeth. Made from biocompatible materials, these artificial tooth roots are set into the jaw and fuse with it, becoming a permanent part of your smile. Compared to traditional tooth replacement treatments, dental implants are non-invasive to neighbouring teeth. Each one stands independently from the rest, preventing the need to alter the tooth shape or structure next to it. 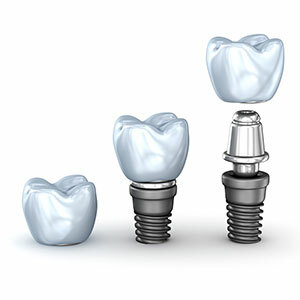 Implants have the highest success rate of any form of restorative treatment. In most cases, a well-cared for implant can potentially last for a lifetime. Although restorations on top of these artificial roots may wear out over time, the implant itself is not likely to fail. With implants, our patients are able to compliment the natural bone anatomy of their jaw and facial profile. This characteristic minimises the possibility of a sunken-in appearance often seen in individuals with missing teeth. We bring a board-certified oral surgeon into our practice to place each implant, with the option of selecting general anaesthesia. Although implant placement is a minor surgery, most of our patients compare their level of comfort to that experienced during a simple tooth extraction. After the implant as fully integrated with the bone, we replace any temporary prosthetics with permanent crowns, bridges or an implant supported denture. In some cases, as few as four implants can support an entire full arch prosthesis. Find out if dental implants are the long-term smile solution that you’ve been searching for. Replace missing teeth or dentures with this reliable restorative option modelled after natural teeth. Schedule your consultation today!